Joe Cacioppo – Resource Concepts, Inc.
Mr. Cacioppo is a veteran of the United States Army and a licensed civil engineer in Nevada and California. He is a principal civil engineer at RCI with over 24 years of experience in public infrastructure; commercial, industrial and residential planning, permitting, design and construction management; and, flood control projects. His expertise with public sector and private projects, along with his understanding of the regulatory requirements, allows him to ensure our clients are provided cost effective, sustainable solutions that meet their budgetary and scheduling needs. Mr. Cacioppo oversees a diverse in-house staff of civil and environmental engineers, materials testing and inspection personnel, survey professionals and support staff. His extensive experience with projects of various sizes and complexities ensures all projects receive thorough and cost effective QA/QC oversight. His expertise combined with our diverse professional staff allows RCI the unmatched ability to assist clients from project conception through completion. 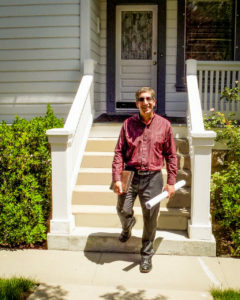 In addition to his technical and regulatory expertise, Mr. Cacioppo has extensive public relations experience, from town hall meetings and neighborhood workshops, to agency and governmental hearings. Mr. Cacioppo has been married to his college sweetheart for over 25 years. Together they have raised three children who are pursuing their educational and professional goals. Mr. Cacioppo is also dedicated to his community. He currently serves as a school board trustee for the Carson City School District and is a Commissioner on the Carson City Parks and Recreation Commission. In his spare time, he enjoys long distance trail running where he participates in races ranging from 10 kilometers to 50 miles in length. His love of the trails translates to the youth athletes he helps train on the middle and high school track and cross country teams.